You know that classic character, Winnie the Pooh, and his term "smackeral"? Well, we all tend to get a little like Winnie when our tummy starts to get a rumbling; we want to break out the snackies!! 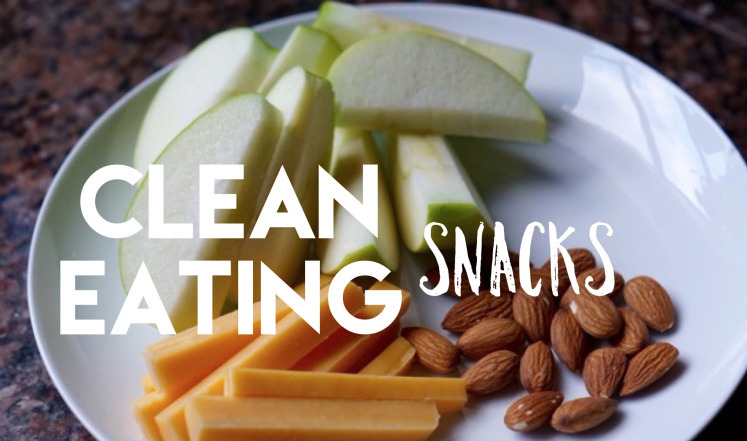 We know how easy it is to fall off the healthy snack band wagon. You get a little hungry between meetings at work, or you have been up all night with a baby, or you just get the munchies, and all of a sudden the candy bars in the hallway vending machine, or hidden in your secret mommy spot look extra tempting. But by preparing a healthy snack and bringing it with you, whether to work, the mall, on a hike, or to the airport, you're bound to make the right choice when your stomach starts rumbling! But healthy snacks don't equal boring snacks. There are so many different options of things you can pack for a simple "smackeral" to eat. 1. Greek Yogurt: Rich in protein, great for digestive health and deliciously creamy! Add in some dried berries or a simple granola and you've got a great snack. 2. Cottage Cheese: Chock full of lots of protein and great calcium for your bones. Can be combined with fruit, veggies, toast or mixed into your scrambled eggs. 3. Dried Fruit: Many types of dried fruits contain the same amount of nutrients as their hydrated counterparts. They are light, delicious and easy to fill up on! 4. Peanut Butter: High in protein and feels like a real indulgence, peanut butter is a great thing to couple with other snacks. Dip your apples, carrots or pretzels into some and you've got a great healthy snack. 5. Oven-Baked chips: Sometimes you just really need something crisp, salty and like a fattening potato chip. By baking slices of potato you cut down on the fat and cholesterol but still fulfill those needs. 6. Air-popped Popcorn: Full of fiber and naturally low in calories popcorn was born to be a healthy snack. Just don't load on the butter, add a dash of salt and pepper and you're set. 7. Berries: Little super food all-stars, berries can be eaten by the handful or with a dollop of yogurt or almonds. 8. Veggies: We all know these are a healthy snack. 9. Hard Boiled Egg: A hardboiled egg is a filling treat that will keep you energized for hours and are packed with great protein. 10. Smoothies: There are so many great green smoothies to help you sneak in more veggies, and even whipping up some great fruit and ice will make for a cold, tasty treat. 11. Apples: These are packed full of health benefits. The saying "an apple a day keeps the doctor away" is fairly true. Apples fiber, antioxidants, cholesterol-fighting properties and benefits to your bone health are just a few of their charms. Eat them alone or dip them in peanut butter or add a sprinkle of cinnamon on top. 12. Rice Cakes: Crunchy and low in calories, rice cakes come in many varieties to keep it exciting to! 13. Seeds: Pumpkin seeds are rich in magnesium and zinc, and sunflower seeds are filled with protein and fiber. Sprinkle them into a granola or trail mix for a yummy snack or eat by the handful. 14. Hummus: This is a GREAT dip to use to help you eat more of those healthy veggies, cause sometimes you just need dip! It's also yummy to dip pretzels or rice crackers into. 15. You don't need to throw out chocolate! I am one who needs a little chocolate every so often (ok, like every day I want it), and so having a little something doesn't hurt just don't go overkill. A small amount of dark chocolate has less fat and calories then milk chocolate, and even contains antioxidants and has heart healthy properties. So, go ahead and mix some of that into your snack lists. Having one of these snacks on hand at all times will greatly reduce your risk of running to your chocolate stash or convenience store for a quick fix. Plan ahead with healthy treats, and feel more energized and satisfied all day. Your healthy New Year Goals don't have to be doomed by the handfuls of goodies you might normally snack on during the day anymore! 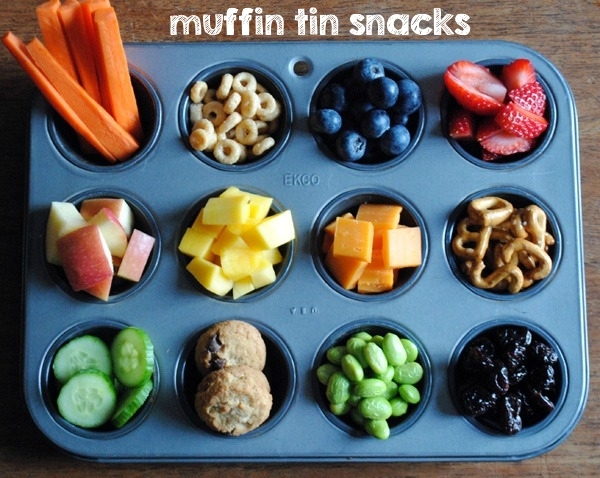 A great way to portion control and get a variety is having a fun way to contain your snackies. The Muffin tin is a great way to get a little of a lot. 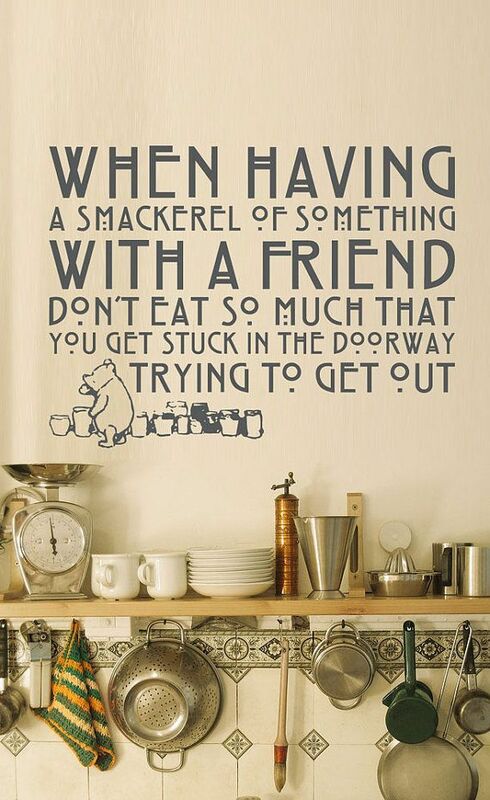 Fill each hole with a favorite snack and then you've got a whole variety of smackerals to fill your munchies craving. It is also a great way to help your children have fun with eating good snacks. Teach them young to enjoy small amounts of healthy foods will save them when they get older and just want to cheat and get the candy bar. These habits will be easier and more second nature if they are started young. So, get your cupboards filled with yummy healthy snacks you can grab when those tummy rumblings begin. What are some of your favorite healthy snacks to eat, share with us below!